I wanted to make some Christmas tree decorations – quickly – for a Christmas tree festival in Dorchester. After mentally flicking through a few ideas in my brain, I decided to needle-felt a little gingerbread man. The result was so cute, I ended up making five! It’s so straightforward and effective, I thought I’d share a teeny tutorial with you. As a certain meerkat would say, Simples! Position your cookie cutter onto the brush mat. Push it well down into the tufts, so it’s secure. Choose your felting stuff colour. For my first man I chose white. Tease off a bit of fluff and push into the cutter. Using your needle-felting needle (or needle), carefully jab the stuff down onto the mat. You’re basically ‘matting’ it into a mass. Keep going until it’s pretty flat. Please be careful not to jab your fingers (it’s easily done!). Add more stuff and gradually build up your man until he’s as thick as you want him to be. Carefully ease the man off the brushes. If you feel he needs more work, press him back into the cutter shape. Using your bodger (not sure this is a technical term!) or something else with a sharp point, gently make two holes in the head, ready for the eyes. Push the eyes through the gingerbread man’s head, and secure at the back. 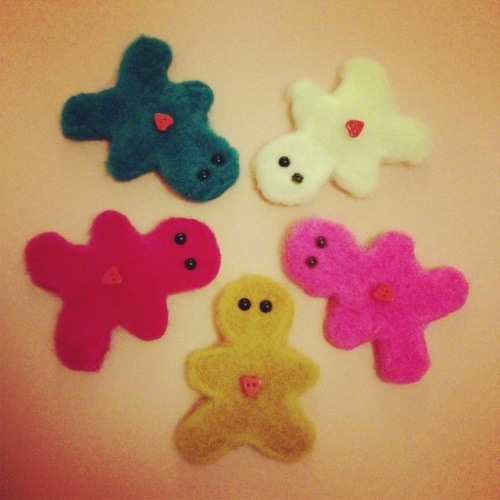 Sew a little button or whatever you choose onto the gingerbread man’s tummy. Sew a short length of nylon thread into a loop on top of the head so you can hang your gingerbread man from your Christmas tree. Ta da! So there you have it… such a simple and pretty way to decorate your tree! It’s really quick and easy to make these wee men (and of course you could use any shape). I made these five in one evening. 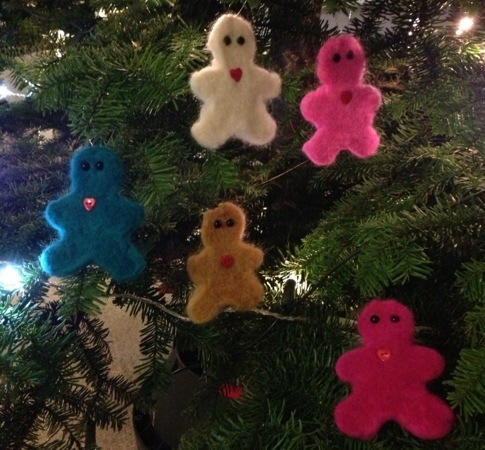 I’d really love to see any needle-felted gingerbread men or other shapes that you make – why not add an image into the home_to_roost Flickr group?